It seems to me that orbs, is one of the more controversial phenomenon that ghost hunters and paranormal researchers deal with. And from what I have been able to gather by doing a little research is that most ghost hunter now dismiss almost all photographs and images of orbs as nothing more than dust particles, insects, pollen or moisture droplets that happen to show up, primarily on pictures that are created with digital photographic equipment using a flash. However there are also some ghost investigators who still adhere to the belief that some of these orbs are evidence of paranormal activity, and perhaps even of spiritual or ghostly energy itself. I have to admit, that I am a fan of paranormal television. And two of the most popular of this type of programming was "Ghost Hunters"which aired on the SyFy channel, and "Ghost Adventures" on the Travel Channel. Ghost hunters, Jason Hawes and Grant Wilson had a tendency to dismiss almost all images of orbs as dust, moisture or anything but paranormal. I think they do this to help squelch some of what the critics and skeptics may say and help make themselves look more analytical and scientific in their approach. Whereas the other group with Zak Bagans, Nick Groff and Aaron Goodwin also dismiss most orbs as dust particles or some other non-paranormal phenomena, but sometimes their so called evidence shows balls of energy or orbs going into their heads, bouncing off their backs or even attacking them. One of their earlier episodes filmed at the Goldfield Hotel in Goldfield Nevada, even shows a sphere of energy or orb that almost looked as if it was caressing Zak Bagan's arm. I have seen a many images of orbs, and of all the images I have seen; this is perhaps one of the more compelling, compelling that it is something other than dust, pollen, insects or something of that sort. It appears to be emanating its own light because of the reflection of the object off the floor. This photo was taken with a digital camera without flash. Could this photo or image have been doctored using Photoshop? I suppose! I am not a photographer, nor am I an expert using photoshop. 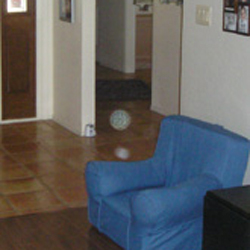 But even if this image is of a genuine orb or sphere of energy, that is still not evidence that it is a ghost or spirit, although I would definitely consider it paranormal because it is not normal to have spheres of energy bouncing around your home.